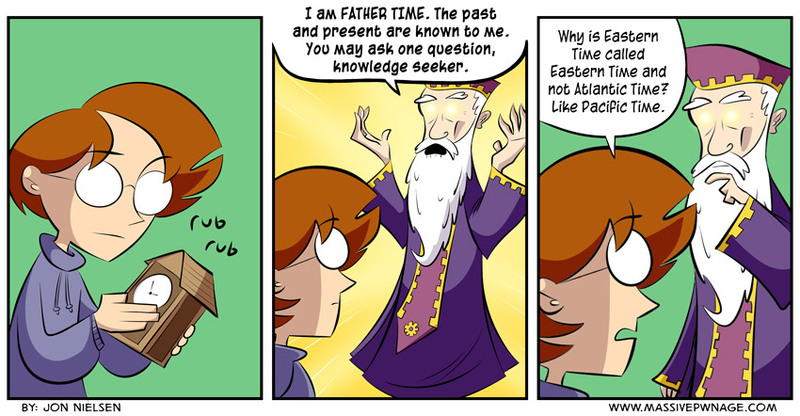 Is Pacific Time ever referred to as Western Time? This entry was posted on Wednesday, March 5th, 2014 at 12:00 am and is filed under Comics. You can follow any responses to this entry through the RSS 2.0 feed. Both comments and pings are currently closed. Atlantic time zone is that gren just on the edge of Canada. I’m still going to remember this strip every time I roll the clocks ahead/back. For that matter, what’s with “mountain time”? Do we not have mountains in other time zones? Does more elevation imply some kind of time differential? Does Mt Everest have it’s own time zone?